There have been many modern-day sightings of creatures that by eyewitness description sound like pterosaurs, or pterodactyl sightings. There are also intriguing rock carvings and even photographs that suggest that this species of amazing flying monsters could have survived extinction, could have soared through the skies of the southwestern United States until very recently and might still exist in small numbers in remote parts of the world. 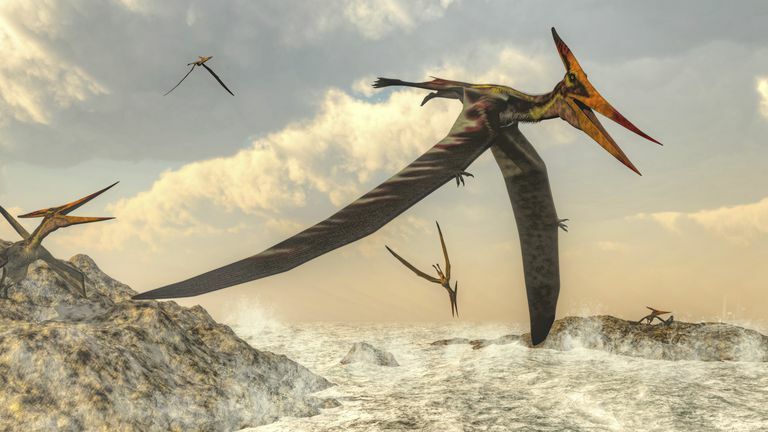 Pterosaurs were not dinosaurs, but a family of large flying reptiles ("pterosaur" means "winged lizard") that includes the pterodactyl and Pteranodon. The pterosaur stood on two rather spindly legs and had wings composed of a leathery membrane that stretched from the animal's extremely long fourth finger to its body. Despite their appearance, they were not related to birds and were highly successful flyers that might have dined on fish and insects. May 1961, New York State: A businessman flying his private plane over the Hudson River Valley claimed that he was "buzzed" by a large flying creature that he said looked like a pterodactyl. The early 1960s, California: A couple driving through Trinity National Forest reported seeing the silhouette of a giant "bird" that they estimated to have a wingspan of 14 feet. They later described it as resembling a pterodactyl. January 1976, Harlingen, Texas: Teens Jackie Davis and Tracey Lawson reported seeing a "bird" on the ground that stood five feet tall, was dark in color with a bald head and a face like a gorilla's with a sharp, six-inch-long beak. A subsequent investigation by their parents uncovered tracks that had three toes and were eight inches across. February 1976, San Antonio, Texas: Three elementary school teachers saw what they described as a pterodactyl swooping low over their cars as they drove. They said its wingspan was between 15 and 20 feet. One of the teachers commented that it glided through the air on huge, bony wings like a bat. September 1982, Los Fresnos, Texas: An ambulance driver named James Thompson was stopped while driving on Highway 100 by his sighting of a "large birdlike object" flying low over the area. He described it as black or grayish with a rough texture, but no feathers. It had a five- to six-foot wingspan, a hump on the back of its head, and almost no neck at all. After consulting some books to identify the creature, he decided it most looked like a pterosaur. While other reports of pterosaur-like creatures have come out of Arizona, Mexico and Crete, it is out of central Africa that some of the most interesting anecdotes have come. While traveling through Zambia in 1923, Frank H. Melland collected reports from natives of an aggressive flying reptile they called kongamoto, which means "overwhelmer of boats." The natives, who were occasionally tormented by these creatures, described them as being featherless with smooth skin, having a beak full of teeth and a wingspan of between four and seven feet. When shown illustrations of pterosaurs, Melland reported, the natives identified them as most resembling kongamoto. In 1925, a native man was allegedly attacked by a creature that he identified as a pterosaur. This occurred near a swamp in Rhodesia where the man suffered a large wound in his chest that he said was caused by the monster's long beak. If pterosaurs really died out with the dinosaurs and their fossil remains were not first discovered until 1784, then a depiction of one could not possibly exist in an ancient rock carving. Yet a pictograph found high on a cliff face near Thompson, Utah seems to show just that. While many experts believe the drawing is a bird, the beak, head prominence, wings, and legs also look very much like those of a pterosaur. Another fascinating tale of a pterosaur literally coming out of stone dates back to 1856 in France. Workmen were digging through Jurassic-era limestone for a railway tunnel between the St.-Dizier and Nancy lines. When a large boulder of limestone was split open, the workers were astonished to see a large winged creature come tumbling out. They said it fluttered its wings, let out a croaking noise and then dropped dead at their feet. The creature had thick black, leathery skin, a beak full of sharp teeth, long talons for feet, and membrane-like wings that spanned 10 feet, 7 inches, by their measure. The body of the creature was taken to the nearby town of Gray, according to the story, where it was identified as a pterodactyl by a student of paleontology. As reported in the Illustrated London News of February 9, 1856, the rock in which the creature had apparently been entombed for millions of years, contained a precise mold of its body. The April 25, 1890, edition of the Tombstone Epitaph ran a story of two Arizona ranchers who claimed to have chased on horseback a flying monster "resembling a huge alligator with an extremely elongated tail and an immense pair of wings." True to the spirit of the West, they shot the creature. Taking measurements, they reported that the monster was 92 feet long with a 160-foot wingspan and a mouth full of sharp teeth. The story is not taken seriously by many researchers today, but it corresponds loosely with a story about a Thunderbird that was allegedly shot in the same area in 1886 and dragged into town to be photographed. Several paranormal researchers claim to recall seeing that photo, but don't know where, and the photo has not been seen since.